Ultra-compact, high performance bluetooth speaker for best sound quality for music, handsfree, and speakerphone. Monsterous driver and passive radiator design delivers unrivaled clarity and superior sound quality. 120 CC of acoustic volume with two 35 mm full range drivers and passive radiator. Bluetooth 2.0 audio and digital signal processing for superior sound quality in a compact design. Never before has such big sound come from such a small package. Just connect your Blackberry or PC via Bluetooth or 3.5 mm minijack cable and enjoy unbelievably clear, room filling music. ClarityHD Precision Micro Bluetooth Speaker is an incredibly flexible wireless speakerphone solution. 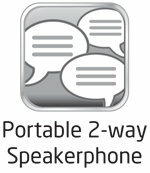 You'll get near lifelike hands-free calls on your Blackberry and even for Skype or iChat voice/video chats on your Bluetooth equipped PC. The built-in mic with advanced noise-canceling let's you use it for instant conference calls in the officeor anywhere you are. You can even use it in your car and still be clearly heard. Small enough to fit in the palm of your hand, ClarityHD Precision Micro Bluetooth Speaker stores easily in your laptop bag or luggage. Its the perfect mobile solution for enjoying hands-free calling and incredible sounding music on the go. Get amazing room filling stereo sound from this incredibly small, portable speaker. 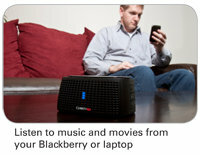 Wirelessly connect ClarityHD Precision Micro Bluetooth Speaker to your Bluetooth equipped Blackberry or PC. It also acts as a speakerphone for hands-free calls on Blackberry and for chats on Skype with your PC. Also features a 3.5 mm input for listening to music from any device with a standard headphone port.